A philosophy professor in Ohio filed a lawsuit against his university on Monday for punishing him after he refused to refer to a transgender student according to their preferred gender pronoun. In January, Nicholas Meriwether, an evangelical Christian and 22-year employee at Shawnee State University, responded to a question from Alena Bruening by saying, “Yes, sir.” Bruening is a biological man who identifies as a woman. Bruening approached Meriwether after class and demanded that he refer to him using feminine pronouns. When Meriwether did not instantly agree, Bruening promised to get him fired and used derogatory language towards the professor. Meriwether, who refers to all of his students as “sir,” “ma’am,” “Mr.,” or “Miss,” offered to use the student’s first or last name instead, but this did not satisfy university administrators or the student. Meriwether believes God created only two genders, male and female, which are determined by a person’s biology. Roberta Milliken, acting dean of the College of Arts & Sciences, launched an investigation into the matter and formally charged Meriwether with causing “a hostile environment” in his classroom for refusing to violate his religious beliefs. The university defines “hostile environment in the educational context” to include “any situation in which there is harassing conduct that limits, interferes with or denies educational benefits or opportunities, from both a subjective (the complainant’s) and an objective (reasonable person’s) viewpoint. Following the investigation, Dean Milliken gave Meriwether two options, stop referring to students by their last names and titles, or violate his conscience and refer to students according to whichever gender they choose. Meriwether submitted a grievance request to the union, arguing the university violated his freedom of expression. The professor met with a school administrator and union representative to explain how his religious freedom was being corroded. According to the lawsuit, they “openly laughed” at Meriwether’s religious convictions and denied his grievance request. Meriwether’s religious beliefs were also ridiculed by school faculty in 2016 after the Obama administration issued Title IX guidance on transgender students. The professor met with Jennifer Pauley, chair of the humanities department, to discuss how the guidelines affected him. Meriwether is being represented by Alliance Defending Freedom, which has won two Supreme Court cases related to religious freedom. CBN News asked Shawnee University for comment but did not receive a reply before publishing. Almost every month, Nato announces that its interception at air protocols have been activated by a Russian airplane getting too close to the border of a Nato member state. These alarm bells constantly sirening in our ears, create the impression we are under a perpetual threat of war. Yet these Russian airplanes never actually violate Nato airspace. What is actually going on? For several years, the Western media, Nato officials and an army of “analysts” have been contaminated with Russiaphobia. Their hearts seem to be heavy with a mortal fear of “aggression” by the Russian Air Force in the proximity of Nato territorial waters in the Baltic and the Black Sea. Let us examine the reasons for this fear, which you are sure to conclude are trivial. In the three Baltic states and Romania, Nato has established a mechanism called “Quick Reaction Alert” (QRA). QRA is a system of rotation involving 150 soldiers, 6 pilots and four fighter planes which respond to a simple mandate imposed on the United Kingdom, Canada, Germany, Italy and other Nato countries to undertake air policing, every four months. 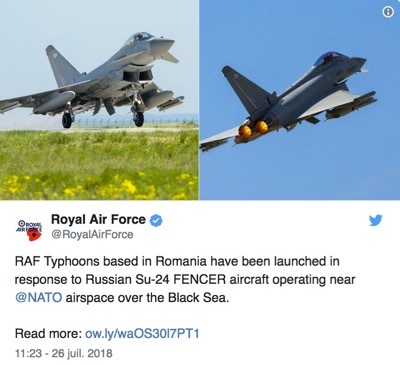 For example, during August 2018, in just one week, the British Royal Air Force made an official announcement that it had carried out three take offs during day and night, from the air base at lMihail Kogalniceanu (Romania), with its Typhoon airplanes in the context of the QRA, to intercept Russian planes that were flying over international airspace above the Black Sea. Both these planes had taken off from Crimea and were on a training flight above the Black Sea, at a distance of 100 miles from the Romanian coast. The British declared that the trajectory of these planes made you think that they were going to leave the international air space and enter accidentally or deliberately the Romanian air space. Yet, the Be-12 is a non-armed hydroplane dating back to the 1960s. It is unarmed and crosses at a speed equal to that of a helicopter. So what is actually going down? It’s all about the pilots keeping their ranking. In this domain, every country has the same regulation for the military Air Force. The six British pilots drafted to the Romanian base of Mihail Kogalniceanu for a period of four months, are carrying out combat service. This is why they cannot carry out training flights like their colleagues in the United Kingdom. If these pilots cannot fly at least once a month, when they return to their country, they have to undergo training, accompanied by an instructor, in planes with pilots. Thus the Western press, with a complete lack of professionalism, makes the inference that the alarm bells signal a real threat and make it “news” for the public. The press do not go to the Defense Ministers of the United Kingdom or Canada to ask him the reasons for such superficial missions and why they do not send training planes (with double commands) to Romania which, although a host nation, is not equipped with Typhon and F18 planes. Thus maintaining the ranking of the Nato pilots drafted in Romania is a necessity. Nato member states fraudulently resolve this issue, agitating the name of Russia. As the Russian Air Force takes off and lands everyday in the air bases at Crimea, 150 – 200 miles from the base of Mihail Kogalniceanu, British and Canadian pilots do not need to make training flights to reconfirm their ranking after a month on the ground. The Russia planes of Crimea are able to play the role of an air force for Nato fighter planes, given that the radars on board the Typhoon and F-18 planes can detect air targets at a distance of 100 miles. To maintain their ranking, two British or French pilots fly for training purposes and choose a day with difficult conditions corresponding to the minimum parameters of difficulty for Typhoon and F-18 airplanes (that is a ceiling of low clouds and poor visibility). They can also choose to fly at night, again in the conditions specified in the minimal parameters. The only prerequisite is that on this day or night, Russian planes are taking off from Crimea. Thanks to this ruse, the six Nato pilots drafted in Romania manage to resolve their problem of keeping their ranking in conditions of a fighting service and with two or three flights per month. After all, they are only men and not machines. This is the entire secret behind the hysteria artificially provoked by the rhetoric “The Russians are attacking us”, the mantra of the Western Press.